1. From Çıralı via the "eternal flames – Yanartas" to Ulupinar and back; 5 hours. 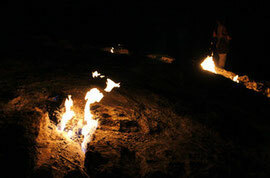 The path follows the Lycian Way through the eternal flames, around two dozen sites, supplied by natural gas and which have burned for thousands of years. Thereafter the path follows the forested valley, rising and falling gently, and at times following the river course. In Ulupinar, one can eat fresh local trout at the restaurant Havuz Basi before returning by the same route. 2. From Cirali to Maden Beach and back; 4 hours. The beautiful coast north of Cirali, comprises numerous small bays, where one can swim and enjoy the view of Tahtali Dagi mountain. The walk follows the coast and provides wonderful views out to sea. 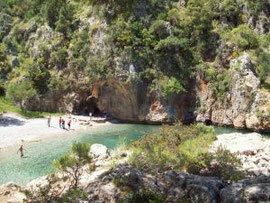 From Maden Beach, one can extend this walk by following the Lycian Way to Tekirova. The walk from Cirali to Tekirova takes ca. 6 hours. 3. From Cirali to Adrasan; 5 hours. Cirali and Adrasan are popular bathing spots, and are linked together by a popular stage of the Lycian Way. 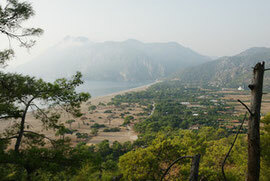 From Cirali, one passes through the ancient ruins of Olympos, with views to the ca. 1000metre high Musa-Dagi mountain chain. Thereafter the path climbs through thick forests to a pass at 700 metres, before descending gently to Adrasan. We can provide you with advice and tips on all walks around Cirali, and even accompany you if you wish. The three suggested walks are only a small sample of the many routes available around the village. We will be pleased to bring you to the start of your walk and/or to collect you at the end.